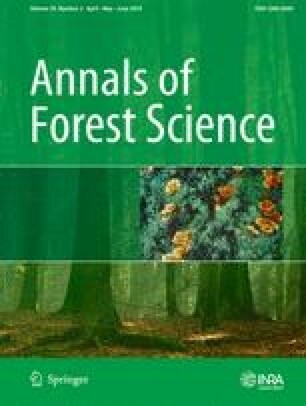 Reduction of forest rotation is analyzed as a potential adaptation strategy for a Douglas fir stand to cope with drought-induced risk of forest decline. The methodology combines a water balance modeling and an economic approach. Results show that, from an economic perspective, adaptation (immediate or delayed) is always better than the absence of adaptation. Reduction of rotation length emerges as a potential adaptation strategy to cope with climate change. The study aims to address the reduction of rotation length to deal with the drought-induced risk of forest decline taking a multidisciplinary approach. We estimate probabilities and impacts of drought events quantified by water balance modeling and we evaluate, from an economic point of view, the reduction of rotation length to cope with the drought-induced risk of forest decline. We compare three different adaptation strategies at the economic level: absence of adaptation, immediate adaptation, and delayed adaptation. Results suggest that immediate reduction of rotation length is associated with the best economic return, followed by delayed adaptation and, finally, by the absence of adaptation. This result is sensitive to the level of timber loss in the event of drought occurrence. If the loss of timber volume is higher than 48%, then delayed adaptation may be preferable to immediate adaptation. Beyond the specificities of the case study, this paper proposes a multidisciplinary approach to address adaptation strategies. Contributions: Marielle Brunette: economic calculation and writing of the article. Nathalie Bréda: estimation of probabilities and impacts of drought, and writing of the article. We thank Abdoulaye Sacko for the work performed during the training course of Master’s degree at the Laboratory of Forest Economics. We also thank Jean-Luc Peyron for his helpful comments. The project was funded by the Mixed Technological Network for the Adaptation of Forest to Climatic Change (RMT AFORCE; http://www.reseau-aforce.fr/). The UMRs BETA and Forest Ecology and Ecophysiology are supported by a grant overseen by the French National Research Agency (ANR) as part of the “Investissements d’Avenir” program (ANR-11-LABX-0002-01; Lab of Excellence ARBRE).